Just a quick update here. The Civil Wars have recorded four tracks with Daytrotter that are now available as a free download. Our site receives a lot of traffic from people searching for free tracks from The Civil Wars so I thought I would link this post to some of their great music. The Civil Wars are made up of the duo of Joy Williams and John Paul White and they have garnered a lot of attention for their unique vocal blends. The Daytrotter recording session includes music from their debut album "Barton Hollow" as well as a really good take on the song "Disarm" by The Smashing Pumpkins. John and Joy do a fantastic job performing this song. I also really enjoy the piano on their song "C'est La Mort". For the new listeners out there, you can expect that The Civil Wars will sing to your hopeless romantic side. They do a wonderful job of vocally interacting with each other throughout each song that gives you the sense of the push and pull of a personal relationship. Thanks goes out to both The Civil Wars and the efforts of Daytrotter to bring quality free music to the fans. 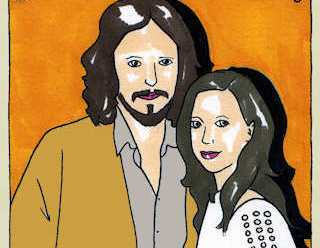 You can download The Civil Wars session for free by using the Daytrotter link below. Update: A free DIGITAL BOOKLET for "Barton Hollow" can be downloaded from the Civil Wars band site. The digital booklet includes lyrics for all of the tracks and band photos as well.